Especially with strokes, survivors can suffer from impaired function, weakness and spasticity. Spasticity causes involuntary muscle contractions in the arms and can even cause even short-term or long-term paralysis as the tendons and tissues around the muscles get tighter. Strokes can really affect upper arm movements too. Survivors only use their affected upper limb approximately 3 hours per day. Survivors only use their affected upper limb approximately 3 hours per day. Individuals who have not suffered a neurological injury use their dominant hand for an average of 9 hours per day. Patients less than 14 days following stroke use their affected upper limb only 38 minutes out of a 9-hour day. Shortening of muscles and connective tissue can start occurring within hours/days. Maintaining a shortened position for a prolonged period of time leads to fibrous adhesion formation, loss of sarcomeres and a loss of tissue extensibility. Fortunately, we can respond to spasticity, and lessened arm movements and muscle tone by harnessing the brain’s own plasticity. Cortical Plasticity, also known as neuroplasticity, is the brain’s remarkable ability to reorganize itself by forming new neural connections based on individual experiences, lifestyle and environment. It essentially is the brain’s ability to “re-program” itself through mass practice, task-oriented arm training. To get these neuroplastic changes, patents participate in skill-dependent rather than simply use-dependent activities. Skill-dependent activities are specific and progressively challenging tasks whereas use-dependent activities are repetition tasks in the absence of a meaningful challenge or an activity that requires problem solving strategies. With these skill-dependent activities cortical maps are continuously remodeled throughout life and after injury by experiences and learning in response to activity and behavior from the stroke survivor. Stimulated through this task training, the brain has the ability to reorganize and form new connections between the intact neurons. The healthy surrounding tissue takes over some of the functions of the damaged area of the brain. Task-specific training with rehabilitation gloves and dynamic splits improve upper extremity function in individuals suffering from neurological injuries. Treatment options are limited for neurological clients who cannot effectively incorporate their hand for functional grasp and release activities. This is where dynamic splints can really help rehabilitation. If the hand and arm muscles are no longer functional, it’s especially important to re-learn basic functions first, such as grasping and releasing objects. A stroke rehabilitation device like the SaeboFlex can make this process easier for some patients and possible for those who otherwise would have no function left. For a vast majority of stroke survivors, especially ones with incomplete spinal cord injury, patients do not exhibit sufficient active wrist and/or finger extension to allow the hand to be functional. 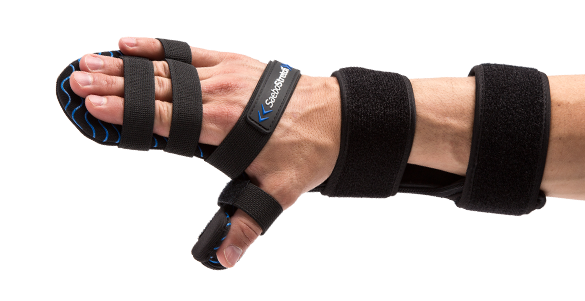 Stroke recovery gloves like SaeboFlex has the biomechanical advantage in allowing prehension grasp and release activities for individuals with moderate to severe hemiparesis. The SaeboFlex and other rehabilitative dynamic splints actually step in to compensate for some of the patient’s biomechanical disadvantages. 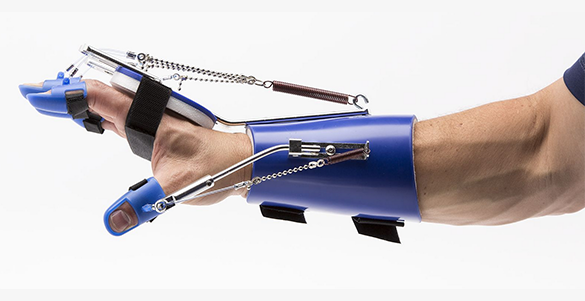 The majority of patients with neurological or spinal cord damage cannot extend their fingers or move their wrists, but this orthosis imitates the hand’s natural functions and makes it possible to grasp and release objects. The goal is to make the hand functional again, but it also minimizes joint damage and pain. When stroke survivors lose function in their upper limbs after a stroke, sometimes hard static splints are used to keep the arm and wrist in a “neutral” position and avoid muscle contracture. Unfortunately, some studies have shown that static splinting is ineffective against muscle contracture, and others have actually linked the practice to joint damage and contracture. Contracture is a loss of motion over time due to abnormal shortening of the soft tissue structures spanning one or more joints. These include skin, ligaments, tendon, muscles and joint capsules. The ideal splint is dynamic, moveable and helps stretch out muscles, tendons and ligaments like the SaeboStretch. The splint’s energy-storing technology allows individuals suffering from spasticity to stretch comfortably and safely resulting in increased motivation and compliance. It allows the fingers to move through flexion caused by associated reactions and increased tone. Allows the fingers to move through flexion caused by postural changes associated reactions and increased tone. As patients recover from a stroke, every effort to restore strength and function is invaluable. Using a stroke rehabilitation dynamic splint is a proven way to reduce pain and complications while survivors focus on their recovery. It may also open up new possibilities by restoring the use of their arms. It’s important to keep the muscles active after a stroke, in order to prevent stiffness and shortening of the tissue. Activity also helps to keep pathways between the brain and muscles open. Stroke recovery gloves that promote sensorimotor stimulation are useful to stroke survivors for many different reasons, from preventing complications to making life-changing therapy methods possible. Therapy is a big part of the recovery process after a stroke, and occupational therapy often incorporates basic elements such as towels or small objects as patients learn to grasp, release, hold, and perform other basic tasks. Stroke rehabilitation gloves like the SaeboGlove can help with these activities. The SaeboGlove is a functional stroke recovery hand glove that has a tension system integrated into it which helps individuals extend their fingers and thumb after grasping. This helpful stimulation helps the neuroplastic changes the brain needs to help reprogram itself. Positive results have been witnessed and experienced with professionals and clients when integrate them into upper arm rehabilitation exercises. Strong potential for future improvement of arm/wrist mobility. Skill-dependent physical activities have long helped stroke survivors reprogram their brains, strengthen their muscles, and improve their quality of life after neurological damage. Stroke rehabilitation gloves and dynamic splints can give the patients the needed stimulation and help they are needing to progress. They are great to help protect the joints while improving strength and mobility. Because patients can incorporate these gloves and dynamic splints into occupational therapy as well as everyday tasks, they make it easier to achieve independence during their stroke recovery. Whether you are a caregiver, occupational therapist or a even a stroke survivor yourself, Saebo provides stroke survivors young or old, access to transformative and life changing products. We pride ourselves on providing affordable, easily accessible, and cutting-edge solutions to people suffering from impaired mobility and function. We have several products to help with the stroke recovery and rehabilitation process. From the SaeboFlex which allows clients to incorporate their hand functionally in therapy or at home, to the SaeboMAS, an unweighting device used to assist the arm during daily living tasks and exercise training, we are commitment to helping create innovative products for stroke recovery. Check out all of our product offerings or let us help you find which product is right for you.